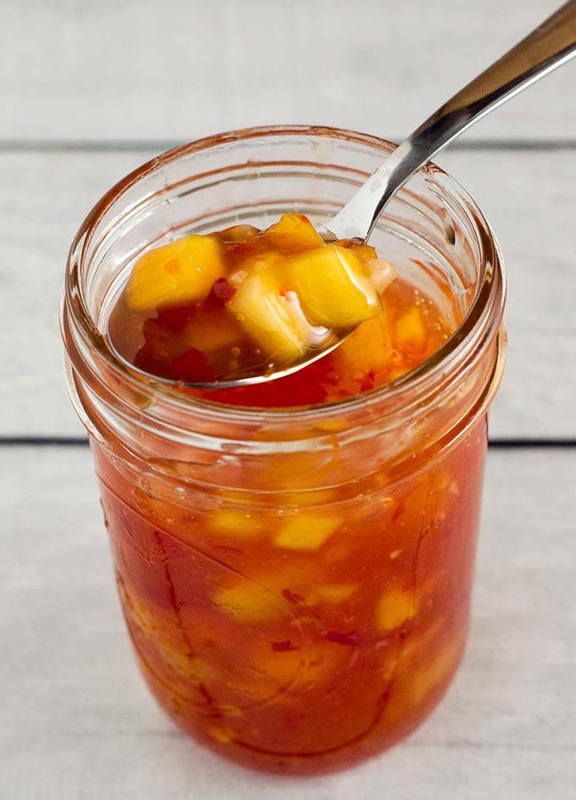 This sticky, sweet mango chili sauce is easy to make and so addictive! Use it to dip shrimp, chicken or fresh spring rolls. It all started with an online conversation about what dip to serve with homemade spring rolls. 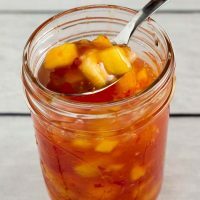 Someone mentioned mango chili sauce, and loving all things mango, I had to find out more. I couldn’t find the brand that she said she had bought, so I decided to see what was involved in making it at home. 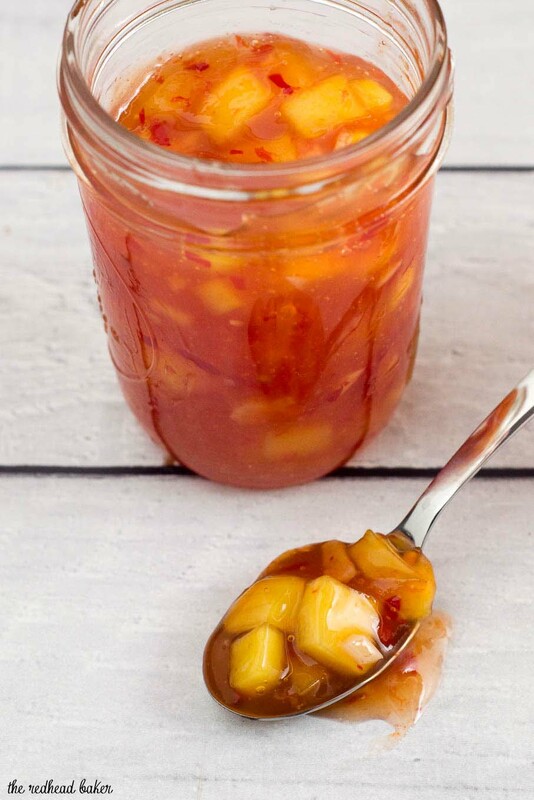 What is mango chili sauce anyway? It’s a twist on Thai sweet chili sauce, which is a mainstay in Thai, Afghan and Malaysian cuisines, among others. In the Western world, it’s commonly served with egg rolls, lettuce wraps, chicken wings and spring rolls. I used it on my Thai chicken pizza. The sauce is both sweet and spicy. The heat comes from a red chili pepper, either a Fresno chili or a red jalapeno. If you prefer a slightly milder sauce, don’t add the seeds and membranes from the chili pepper to the sauce. This is a really easy sauce to make. It’s ready in less than 30 minutes! If you can’t find a Fresno or red jalapeno pepper, look to see if your grocery store sells a tube of chili pepper paste, either in the produce section, or in the International Foods aisle. 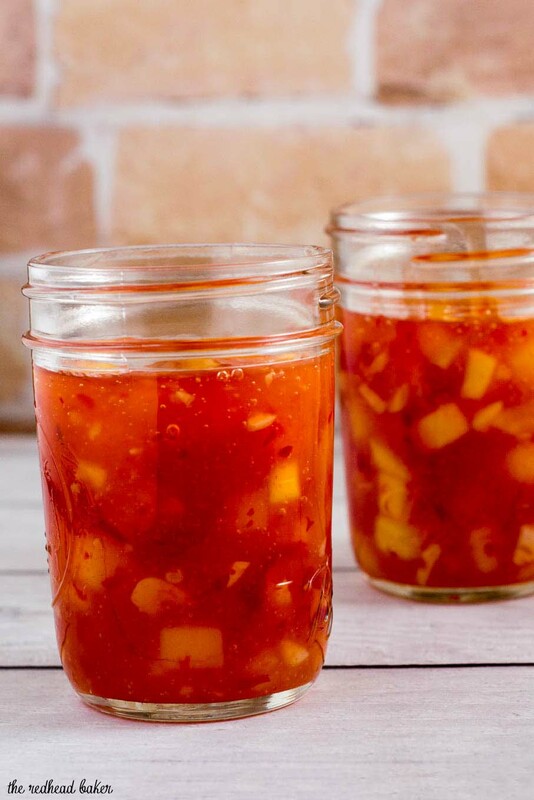 The sauce can be stored in a glass jar in your refrigerator for up to a week. If you don’t think you’ll use a whole pint, reduce the sauce by half. Or make the whole batch, divide into two half-pint glass jars, and give the other jar away. 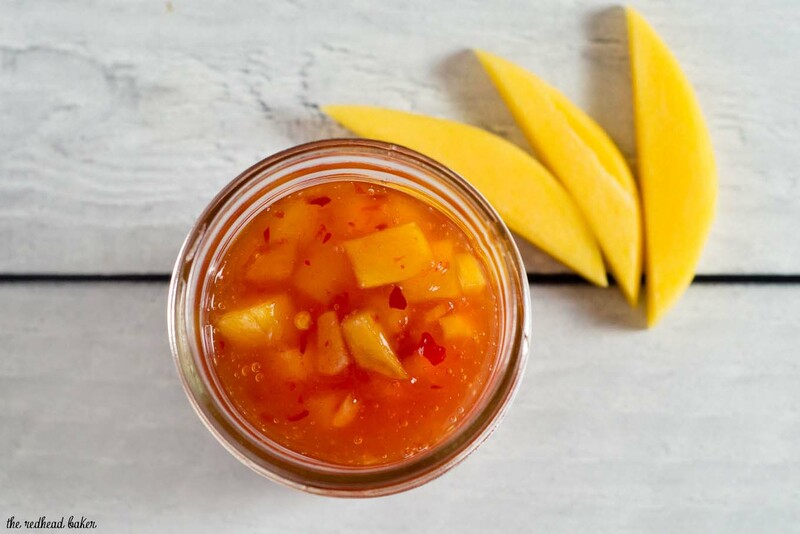 What can you do with mango chili sauce, anyway? Use it as a dip or marinade for shrimp, fish, chicken or pork. Use as a dip for egg rolls or spring rolls. Add it to cooked rice or soup. Spread it on lettuce wraps. 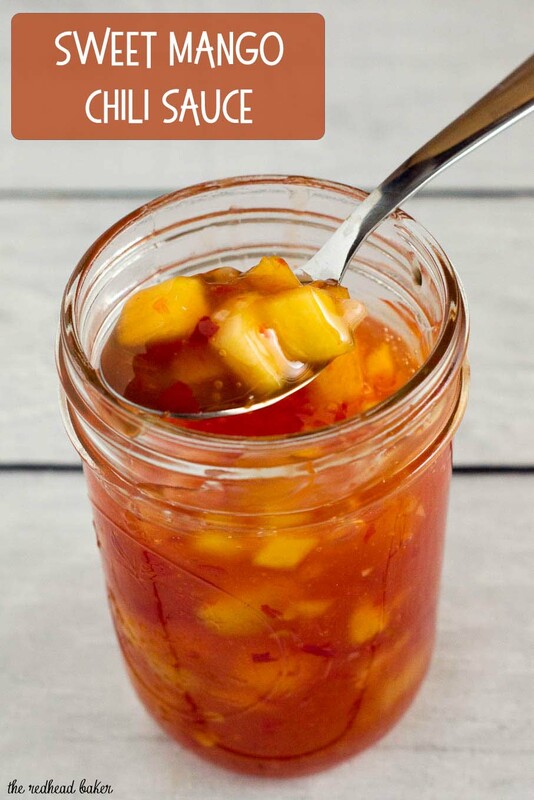 It really livens up any dish, so if you’re stuck in a rut, try adding a spoonful of this sauce! Place the first 9 ingredients into a saucepan. Increase heat to medium again and return to a boil. Mix the 3 tablespoons of water and 1 tablespoon of cornstarch. Add to the pot and stir until sauce has thickened. Add the diced mango to the pot. Store in a mason jar or other glass container in the refrigerator for a week.